Sony’s cheapest 4K HDR TV range of 2017 certainly has shelf appeal with its aggressive price and attractive design. Its pictures sometimes look strong, too. However, if you were hoping to get a convincing high dynamic range picture for so little money, you’re out of luck – Sony’s XE70 Series doesn’t have them. At just £649, the 55XE70 – the middle child of Sony’s all-new XE70 Series – is the most affordable 4K HDR 55-inch TV in Sony’s 2017 range. This makes it a potentially mouthwatering proposition given the impressive performance of every other Sony TV we’ve tested this year. Its price includes a solid smart system, too – though, it’s worth pointing out that you don’t get the Android TV platform featured on more expensive Sony TVs. There are some good things about the 55XE70’s pictures but, if you’re serious about HDR, you’d be advised to try and increase your budget a bit. The 55XE70 might feel like it should for the price, but it doesn’t look it: By which we mean that its lightweight build feels almost 100% plastic when you’re setting it up, yet you don’t really feel aware of this flimsiness when looking at its angular, minimalistic design from a typical viewing distance. The open frame stand is particularly good at delivering this illusion of quality. For while it’s so plasticky it bends and flops about before you attach it, once screwed to the TV frame it suddenly becomes reassuringly rigid and looks actually quite posh with its gleaming faux-metallic finish. It’s nice to find the 55XE70 using a centrally mounted stand rather than edge-mounted feet too, since this means you don’t need to find a particularly wide bit of furniture to put it on. Connections are fair enough for the 55XE70’s price point: Three HDMIs lead the way (two of which can handle HDR), partnered by three USBs, an aerial input for the integrated Freeview HD tuner, an optical digital audio output, Wi-Fi and Ethernet network connections and, in a slightly odd throwback to the past, a composite video port. 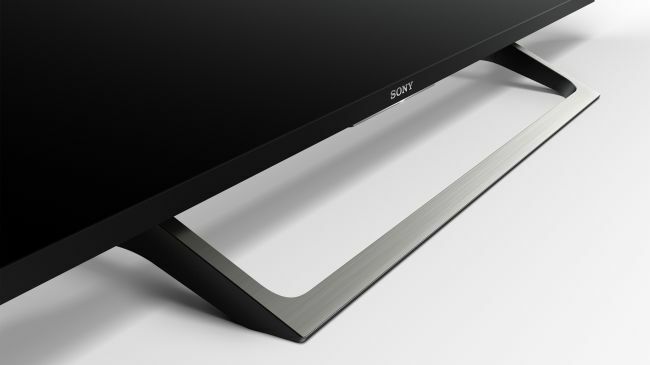 One very nice thing about the connections is that in keeping with all of Sony’s TVs this year, the stand provides built-in conduits for hiding away all of your cable spaghetti. 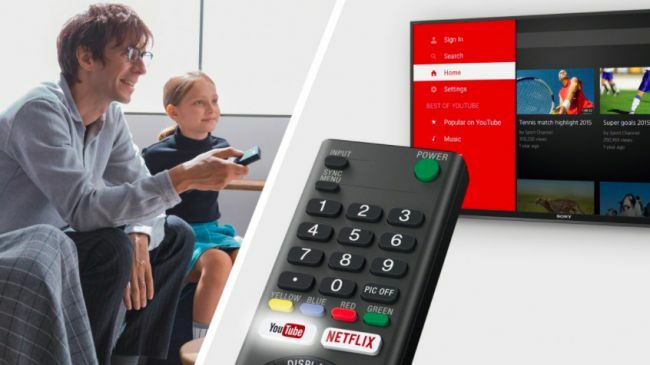 The remote control shipped with the 55XE70 is not one of Sony’s finest hours, however – its build quality is plasticky in the extreme, and while it handily sports direct buttons for YouTube and Netflix, its main navigation buttons are far too cramped together for comfort. Even after using the remote for days we still routinely accidentally chose the wrong button. Design: TL;DR: Although it’s far from the most opulently built TV you’ll see this year, the XE70 looks crisp and clean from a normal seating distance. Unlike all the TVs higher up Sony’s 2017 range, the 55XE70 doesn’t carry Google’s Android TV platform. This is arguably a cause for celebration rather than annoyance, though, given Android TV’s clunky, cluttered, sluggish and, worst of all, buggy interface. 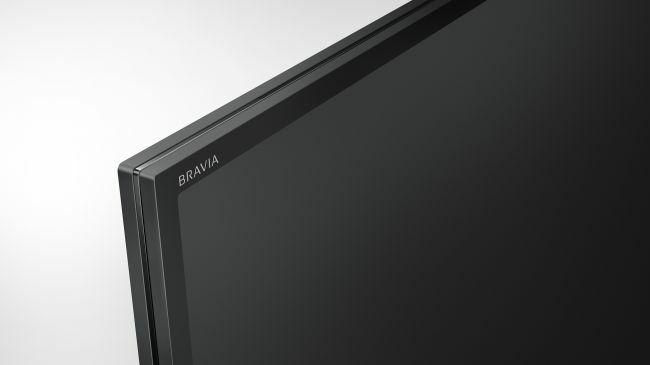 Compared to the other Sony TVs we’ve used this year, it’s certainly refreshing how fast the menus load, how relatively simple they are to browse, and how focused they are on apps you might actually want to use on a TV. They also cover the key US bases by carrying Netflix, Amazon, YouTube (all in their 4K HDR-streaming incarnations), plus all of the ‘big four’ UK terrestrial broadcasting catch up services: the BBC iPlayer, ITV Hub, All4 and Demand 5. The only serious omission, really, is Now TV. Unless, unlike us, you happen to be a big fan of the countless game and infotainment apps that you get with some more ‘content-rich’ platforms. Smart TV TL;DR: The 55XE70’s smart system is pretty basic by current smart TV standards … but that arguably just makes it easier to use over Android TV. With good old HD, standard dynamic range video of the sort that still eats up the vast majority of your viewing time – for this, the XE70 Series is excellent for the money. Its ability to deliver – after a bit of tweaking – a really rich, deep, even black colour during dark scenes is particularly impressive for a set that uses edge-mounted LED backlighting. The tweaks we mentioned involve reducing brightness to around its 26 level, reducing contrast to around 85, setting the advanced contrast enhancer to high, and the Black Adjust feature to Medium. Take special care with that last adjustment, since if you leave it on ‘Low’ dark scenes look too grey, while if you put it on ‘High’ shadow detailing takes a hammering. The XE70 also punches well above its weight with its upscaling of HD sources. 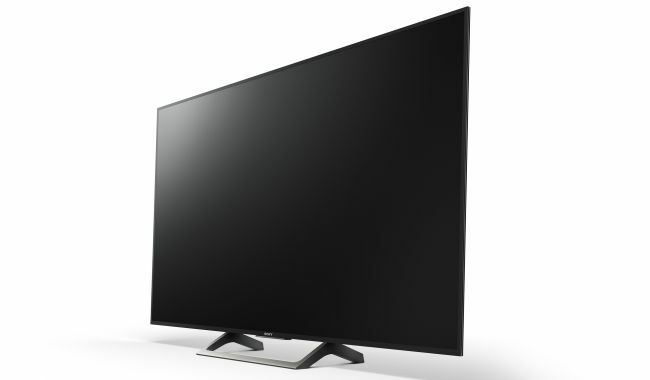 Its 4K X-Reality Pro processing system is no longer the state of the art among Sony TVs, but it still manages to add in the millions of extra pixels required to make HD into 4K without exaggerating source noise, making narrow edges look stressed, or suffering any of the common side effects you get with less impressive upscalers. The prowess of the 55XE70’s upscaling can also be seen in its superb SDR colour performance. Tones across the board look natural, full of nuance, punchy by SDR standards and free of that plasticky, cartoonish look you get with less refined TVs. Sony has even been able to retain its traditional strength with motion handling on the series, too. Its Motionflow processing is better than any rival platform at smoothing away judder and blur without generating unwanted side effects. Though actually, even if you choose not to use Motionflow on purist grounds, movement still looks markedly crisper and more natural on the 55XE0 than it does on the vast majority of other similarly affordable TVs. There are a trio of niggles with the 55XE70’s SDR/HD performance, the most serious one being the set’s very limited viewing angle. Watch from more than 20 degrees off axis and the picture starts to grey over and lose colour intensity. Lesser issues are some slight shadow detail crushing when you’ve optimised the contrast settings to deliver the most realistic black colours, and the occasional appearance of gentle ‘torchlight’ backlight clouding sneaking into the picture’s top corners when a mostly dark image contains a bright object at its centre. Let’s finish on an upbeat note, though, with the 55XE70’s input lag performance: The set takes, on average, barely 20ms to render image data received at its inputs, making it a prime contender as a big-screen gaming monitor. In fact, for much of the time its input lag is barely 10ms; the mean figure is only pushed up by the occasional momentary 50ms slip. HD/SDR performance: The 55XE70 is terrific for its money with HD Blu-rays and digital HD broadcasts. Its upscaling is excellent, and its contrast and colours are strong. Just try not to watch it from a wide angle. 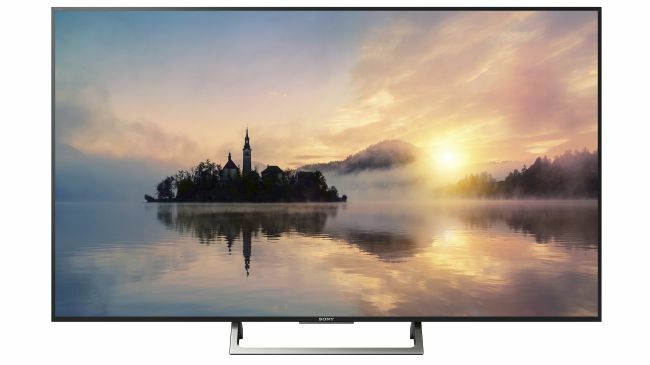 The 55XE70 gets one half of the 4K/HDR equation right, at least, as its pictures do a surprisingly good job for such an affordable TV of delivering the extra detail, textures and depth associated with a 4K-resolution image. The clarity even holds up well when during camera pans, or when there’s a lot of movement across the image, thanks to the motion prowess discussed in the previous section. The clarity of 4K motion is especially mesmerising and effective with MotionFlow set to standard. The 4K X-Reality Pro processing engine also helps to enhance detail with 4K sources beyond what you see with other ‘budget’ TVs (as well as improving HD upscaling, as mentioned in the previous section). Just don’t be tempted to set the Resolution component of the menus’ Reality Creation feature too high, though, or 4K pictures will start to look noisy. Also, though, keep the noise reduction systems all turned off for native 4K content if you don’t want to lose some of the image’s lovely crispness. The 55XE70 is, alas, on much shakier ground when it comes to showing high dynamic range (HDR) images. For starters, it just isn’t bright enough to do the HDR format justice. We measured light output from a 10% pure white HDR window of around 360 nits. Most high-end HDR TVs, by comparison, try to hit 1000 nits and beyond – not least because that’s the brightness level at which much of today’s HDR content is mastered. Only having 360 nits in its arsenal means the 55XE70 only provides a marginal sense of HDR’s extra peak luminance punch over SDR images, for instance. You’re also denied pretty much all of that extra sense of ‘daylight’ brightness with exterior shots that’s one of HDR’s main raisons d’etre. Colours hardly enjoy any more ‘volume’, vibrancy or real-life lustre in HDR than they do with a traditional HD, SDR image. In fact, HDR colours occasionally – especially with skin tones – look slightly less natural than SDR ones, as the TV struggles to deliver enough brightness to unlock the full palette of tones a wide colour gamut HDR source provides. 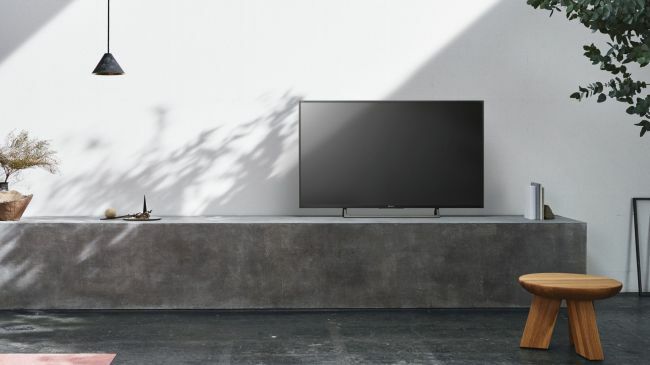 We suspect the 55XE70 is also suffering here because it doesn’t boast the impressive Triluminos colour engine sported by Sony’s higher-end TVs. That’s not the only way in which HDR pictures can actually be more uncomfortable to watch at times than SDR ones, either. There’s also some pretty noticeable ‘clipping’ in the brightest areas of HDR images. In other words, the set’s lack of brightness prevents it from being able to resolve subtle tone details in the brightest areas, leaving such areas looking hollow, bleached and also, at times, strikingly noisy – almost pixellated, in fact. Then there’s the 55XE70’s black level response. This Sony set doesn’t have any local dimming; it can only adjust the brightness of its whole array of frame-mounted lights to suit changes in the content, rather than running different light segments at different luminance levels. This means that when it has to show a bright HDR element amid an otherwise pretty dark backdrop, the image becomes rather grey and flat as the set trades the need to get brightness to the bright element against the need to keep the rest of the image looking dark. Sony’s step up models, the XE8596 range and, especially, the XE9005 range, deliver this sort of LCD light compromise much more effectively. There’s a touch of unevenness to the backlighting at these moments too, leaving some areas looking marginally cloudier than others. There are much worse offenders out there in this regard, it must be said. But it’s still another slight distraction on top of the general washed look to dark HDR scenes. It’s worth adding finally, too, that the viewing angle limitations noted in the HD/SDR performance section are exacerbated with HDR content, at least where contrast loss is concerned. 4K/HDR Performance TL;DR: From a 4K perspective the series is excellent. It’s crisp, detailed and good at retaining its sharpness with 4K motion. It’s not bright enough to really make HDR count, though, and its backlight causes one or two HDR issues too. The 55XE70 doesn’t feature any forward facing speakers, and its build quality doesn’t exactly scream ‘hi-fi’ either. In truth, though, while it doesn’t set your ears alight, it’s functional enough to make adding a soundbar a luxury rather than an outright necessity. There’s a reasonably open and dynamic feeling to its midrange that helps it avoid distortion and excessive harshness, even though there’s not much bass around to add meat to action scenes. That said, it can go reasonably loud, too, and also manages to spread its sound pretty successfully beyond the confines of its bodywork. Sound TL;DR: The 55XE70 manages a clean, open sound despite its flimsy build quality. Don’t expect much bass, though. There aren’t many 4K HDR TVs around at the 55XE70’s price point, sadly. Hisense’s 55N6800 costs pretty much the same, but while it offers slightly better black levels, the Sony beats it on colour, motion and 4K upscaling. 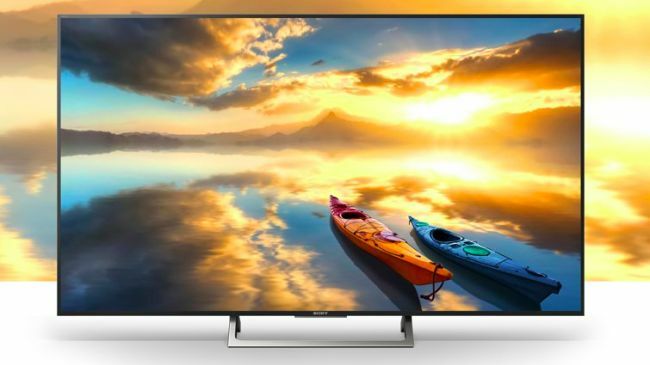 Our advice here, really – at least if you care about HDR – would be that you try and save up for a brighter, more colour-rich step-up model such as Sony’s own 55XE8596, or the Samsung 55MU7000. If you’re not bothered by HDR the 55XE70 is worth considering. 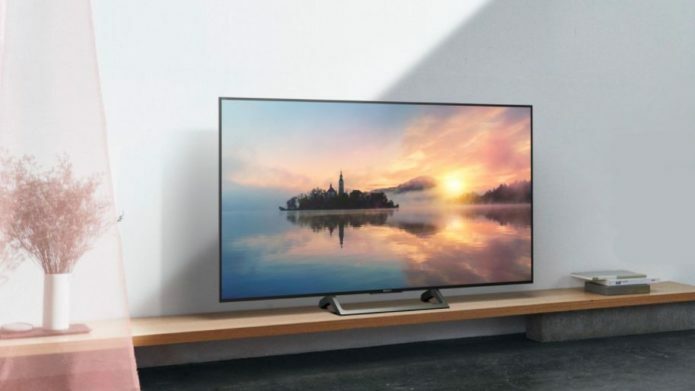 Its 4K standard dynamic range and HD SDR pictures are both very strong for such an affordable TV, and while its smart TV system is limited in scope, it ticks all the key boxes most UK TV users would want. It’s not bright enough to do HDR justice, though. In fact, trying to play HDR on it arguably does more harm than good to its pictures. A bit of a problem when you consider that some sources – such as streamed shows from Amazon and Netflix, and 4K Blu-ray playback from some relatively basic 4K Blu-ray players – don’t let you separate their 4K playback from their HDR playback.